Nobody likes an unpleasant surprise, especially when that unpleasant surprise is are unwanted rodents in your kitchen. Rodent control is incredibly important for any homeowner, and destructive animals like rats and squirrels can be a nightmare for your home. Here are just a few reasons why animal and rodent removal are so important, and a bit of information on what kinds of damage rodents can do to your home. Rodents, particularly rats, can and will chew through just about anything. This is particularly true for nesting mice and rats; when building their homes inside your homes, mice and rats will use just about any scrap they can find. This includes thermal insulation, wiring, fabric scraps, and more. Of course, all this material has to come from somewhere, and that somewhere just so happens to be your house. When rodents chew through building material like insulation and wiring, they can cause big problems for you. A gnawed-through wire can be a fire hazard, and sometimes rats will even nest in electrical boxes for warmth, causing even more potential danger. Aside from chewing through your home and causing damage, rodents will happily feast on your food as well. 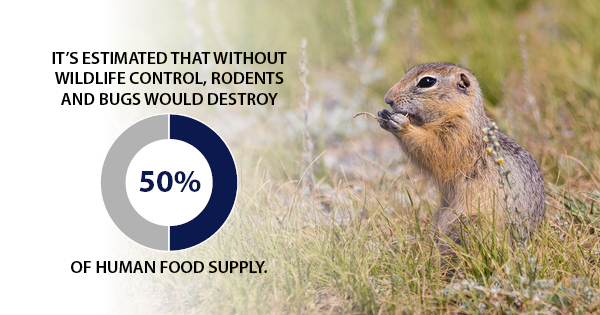 It’s estimated that without wildlife control, rodents and bugs would destroy 50% of human food supply. That’s because most rodents will happily eat just about anything humans do and then some. Think it’s safe because it’s packaged? Think again. A cardboard box is just an added bonus for the little critters; they’ll be able to use the packaging as nesting material. It’s not just the food that they do eat you need to worry about – it’s the food that they don’t eat, too. Rodents can contaminate far more food than they actually consume through droppings, hair, and other contaminants they may have picked up while scurrying around. If you believe you may have a rodent infestation in your home, make sure to call Legacy Rodent Control for humane rodent removal. The sooner you can get these pests out of your home, the better. Rats and mice might look cute, but left unchecked, they can cause severe damage to your home.